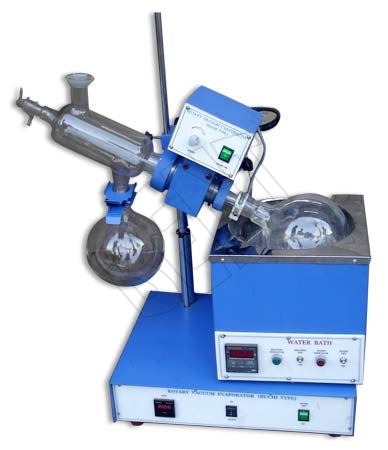 Vacuum Rotary Evaporator is basically used in chemical laboratories for removing solvents from samples by evaporation. It is recommended for use in evaporations which is often complicated by foaming, sensitivity of heat, and many more. The apparatus shakes the samples and consistently exposes a fresh surface through rotating the container that is kept in an evacuated condition. Clamped to V shaped heavy duty retort stand, the drive unit having speed control motor is highly efficacious. We are one of the leading manufacturers of Vacuum Rotary Evaporators and guarantee our customers 100 percent satisfaction by providing excellent quality products.